The sitting room is the most well equipped room in terms of sockets, since it is probably the most used room in the house, and is the main entertainment venue within the house. The idea is, one could be say, watching a film, the front door bell rings, the TV switches to the outside view, and the phone rings to allow you to use it as an intercom to answer the door. Or, the phone rings, and the details are displayed on the TV screen. The plethora of network points also enable laptops to be plugged in to perform tasks across the network or to play networked games. 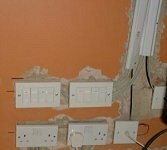 The room is equipped with 20 CAT 5e network points fitted in groups of 4, in 5 double wall boxes. These are used for distribution of phone, LAN and HAN points without having to trail wires everywhere. The video connections in the room are supplied by 2 UHF wall sockets, although much of the video distribution in the house will eventually be carried by the CAT 5e network cable. Speaker cable is chased into the wall to allow connections to be made to loudspeakers without having to trail speaker cable around the room. Using the X-10 modules is easy, since as with many of the other rooms, the X-10 devices I use are wall plug models so they can easily be swapped around. Within the sitting room are a TM12U remote control module, 2 LM10U lamp modules and 2 AM10U appliance modules. 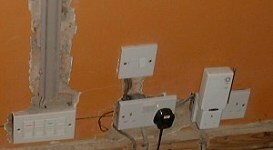 Like much of the rest of the house, although all the wiring is plumbed in, visually, things are rather a mess at the moment, as can be seen from the following photographs.